Ischemic stroke is a leading cause of death in the United States, according to the Centers for Disease Control and Prevention. If not fatal, it can lead to profound long-term physical disability. Clinicians need to rapidly restore blood flow to minimize or eliminate physical impairment caused by ischemic strokes and doing that involves thrombus (blood clot) retrieval. And U.S. physicians may soon have another tool in their arsenal to treat ischemic strokes: the Trevo System. Developed by Concentric Medical Inc, the system has been used successfully in Canada and Europe, and the technology allows for faster and easier clot removal, making a critical procedure much more predictable. In the United States, the technology is undergoing testing in a clinical trial called TREVO 2. (TREVO stands for Thrombectory Revascularization of large Vessel Occlusions.) The new study builds on previous Concentric retrieval trials including the MERCI and Multi Merci trials as well as the initial TREVO study, a multicenter, prospective trial conducted in Europe in 2010. In February, the first patients were enrolled in the TREVO 2 study at the Oregon Health and Science University in Portland and at Capital Health in Trenton, N.J. Researchers will determine the safety and efficacy of the system for clot removal and subsequent blood flow restoration in ischemic stroke patients. The system is designed to provide quick access to the clot, rapid integration with the thrombus, and subsequent effective retrieval. It represents a complete system that can be used with other Concentric products, including its microcatheter, balloon-guide catheter, and distal access catheter solutions. All are minimally invasive devices delivered into the brain to restore blood flow by removing clots related to ischemic stroke. The system has been validated and approved in Canada, where the first cases involving the system were performed in 2010 at Foothills Medical Centre in Calgary. Mayank Goyal, MD, a clinical professor in the radiology department, was the first North American physician to use the system. He provides a broad perspective about this new direction in treatment. “The concept involves opening the occluded vessel, and people think about this in different ways. Concentric’s products involve pulling out the clot, and that was the idea behind its Merci device, a precursor to Trevo,” he says, describing the innovation like a corkscrew where the clot is entangled and drawn out of the body. Second-generation devices, he adds, were vacuum devices that basically sucked out the clot. The medical center used the Merci device for nearly a decade. “It was the first of its kind and quite effective, but it had some limitations so we sought newer devices with modifications,” recalls Goyal. The center’s search led to Concentric’s Stentreiver. “The device is like a steel mesh that entraps the clot. After a few minutes, you can pull out the device, removing the clot in the process,” he says. Goyal relates a case that demonstrates the potential of the Trevo system. It involved an 82-year-old woman who presented with weakness on the left side. Tests revealed right hemiparesis and aphasia, and CT angiography (CTA) showed a clot in the M2 division of the middle cerebral artery. As a result, the patient showed dramatic improvement in the days following the procedure and was up and walking. “It’s very unusual to see that kind of rapid improvement in victims of major strokes,” notes Goyal, adding that the center performed five more cases (four in 2010 and one in 2011) where it deployed the technology. 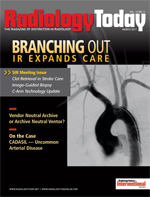 Meanwhile, in Europe, the first cases using this thrombus retrieval system were performed in 2009 and 2010. Tommy Andersson, MD, PhD, who heads neurointervention at Karolinska University Hospital in Stockholm, Sweden, completed one of the first cases involving the Trevo system and found it effective enough to be considered a major advance in ischemic stroke treatment. As with Foothills Medical Centre, the Swedish institution had worked with Concentric’s Merci technology (the Trevo predecessor) and experienced good results. “When Trevo was in development, we actually consulted with Concentric about desired features based on our experience with [the Merci solution],” says Andersson. “The patient was scanned with CT, CTA, and CT perfusion. Scans revealed that he had a dissection in the left carotid artery—that is, the layers of the arterial wall had separated, causing a narrowing of the lumen but no leakage. But he made a spontaneous and complete recovery after investigation,” Andersson explains. Subsequently, a local blood clot formed, apparently caused by the disintegrated wall. “However, at the moment, there was no obstruction, and we assumed the clot had disintegrated,” says Andersson. But the clot was eventually swept up in the blood flow, moved in a distal direction, and finally obstructed the main stem of the middle cerebral artery. The patient was admitted to the stroke ward and placed on heparin to prevent the formation of additional blood clots. However, about nine hours later, the patient disobeyed medical orders and got out of his bed. As a result, symptoms returned; his NIHSS score was 14. “We rescanned him and saw that he now indeed had an obstruction in the major trunk of the middle cerebral artery as well as signs of too little blood going to the territory of the obstructed vessel but no definite infarction,” Andersson says. Andersson provides additional details about the Trevo’s clinical application and how all the elements came together: The Stentreiver is the actual device, and it is delivered through a microcatheter that is introduced into the body through a so-called guide catheter advanced from the groin, with its tip positioned in the internal carotid artery. “It’s beneficial to use the guide catheter that Concentric developed for its Merci system—the Merci Balloon Guide Catheter—as it has an inflatable balloon close to the tip. By inflating this temporarily, you can actually reverse the flow in the carotid artery for a short time while retrieving the clot. This means that you mostly pull ‘downstream,’ and any lost clot will move downward to the guide catheter instead of moving into the more distal brain arteries,” Andersson explains. Further, the distal access catheter, while optional, can be used to enhance the microcatheter to increase stability and make the thrombectomy more efficient. However, it’s also possible to pull the clot into the catheter instead of into the guide catheter, a technique preferred by some physicians. “We all have our preferred technique, and no one can really say which is best,” Andersson says. Andersson says the system is an advancement because it enables physicians to reliably perform fast procedures, as speed is crucial. “Time is the enemy in acute stroke treatment. Cells die every minute that a clot obstructs blood flow,” he says. But speed shouldn’t come at the cost of safety, and that’s one of the most important elements of the Trevo System. “It allows us to work rapidly and effectively but in a safe fashion,” says Andersson. Further, the system was designed to be easy to use. “When you’re treating an acute stroke patient, it’s very easy to get stressed. In such stressful situations, it’s important to have a user-friendly device,” he notes. But that doesn’t mean that any physician can readily deploy the technology. “Remember, you’re dealing with brain vessels,” Goyal says. “You’re trying to understand something that is three- and not two-dimensional. True, compared to something like the Merci device, it’s easier to use. At the same time, you need to go through years and years of training to be able to effectively use the technology. You’re dealing with an emergency situation where patients are very ill and speed is critical. So you’re talking about procedures that are extremely complex and highly intense. So when you say it’s easy to use, you have to place it within context. “There are several devices in the marketplace that operate in similar fashion. Trevo is one of them. We use the others, too,” he adds. Effective stroke treatment can be as potentially overwhelming as the disease itself, he says.